New consumer technologies just keep emerging. Some of them seem cool, some seem strange, and some appear a little too futuristic or out of this world. One thing is for sure, as long as people have needs, the minds behind technological innovations will always be striving to fulfill them. The premise behind the curved displays is to have less distortion, glare, and light intrusion. LG has come out with a 6-inch smartphone with a subtle curve behind the screen (LG G Flex) while Samsung showed off a 105-inch curved UHD television. Samsung has even introduced a special edition Galaxy Note Edge that incorporates the curved display. PlayStation Now has just revolutionized the gaming industry. Its goal is to address the frustration of having to purchase disc or download to play games. PlayStation Now is a game streaming service that allows players instantly access the most updated versions of games for PS3, PS4 and PS Vita. Users can also rent the games that interest them instead of buying in full right away. Intel has come out with the RealSense camera, a small device that can fit at the top of a tablet or laptop. Thanks to the infrared and color-mapping technology, it can create 3-D images, which can be useful for gaming, video image manipulation, and motion detection. Overall, it is just pretty cool to have a 3-D camera, don’t you think? DoorBot – Wi-Fi enabled doorbell that allows owner to speak with incoming visitors using the video call function of an Android or iOS smartphone. 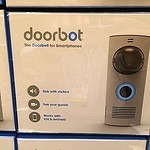 It also works with several devices so anyone at home can answer the DoorBot. Kwikset Kevo powered by UniKey – It is inconspicuous because it looks just like any other front door bolt lock, but it is actually operated by the touch of a finger. Virtual keys can be assigned, and monitoring is possible with Kevo app. These consumer technologies are already very cool, but they are far from the last ones we will see. The coming years will surely present more surreal techs to blow our minds with the features.